160 pages | 6 B/W Illus. 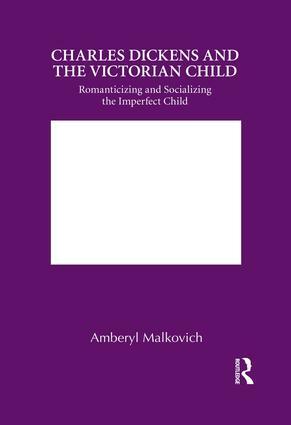 This book explores the ideas of children and childhood, and the construct of the ‘ideal’ Victorian child, that developed rapidly over the Victorian era along with literacy and reading material for the emerging mass reading public. Children’s Literature was one of the developing areas for publishers and readers alike, yet this did not stop the reading public from bringing home works not expressly intended for children and reading to their family. Within the idealized middle class family circle, authors such as Charles Dickens were read and appreciated by members of all ages. By examining some of Dickens’s works that contain the imperfect child, and placing them alongside works by Kingsley, MacDonald, Stretton, Rossetti, and Nesbit, Malkovich considers the construction, romanticization, and socialization of the Victorian child within work read by and for children during the Victorian Era and early Edwardian period. These authors use elements of religion, death, irony, fairy worlds, gender, and class to illustrate the need for the ideal child and yet the impossibility of such a construct. Malkovich contends that the ‘imperfect’ child more readily reflects reality, whereas the ‘ideal’ child reflects an unattainable fantasy and while debates rage over how to define children’s literature, such children, though somewhat changed, can still be found in the most popular of literatures read by children contemporarily. Amberyl Malkovich is Assistant Professor of Victorian Literature, Children’s and Young Adult Literature and Gender Studies at Concord University, USA.